As part of our treatments, we develop and submit detailed condition and treatment reports that often contain additional analytical testing results for wood species identification, coating analysis, elemental analysis, and information relating to the history of the object and its production. We perform collection surveys describing the object in detail including its specific condition and recommendations for treatments, environmental conditions and handling and maintenance recommendations. Our firm advise appraisers, curators, and owners of furniture and architectural woodwork through a variety of consulting reports. Below are images showing analytical testing on a Bembe and Kimbel armchair (on the left) from the Hall of the U.S. House of Representatives. The bottom left image shows a sample micrograph of the remnants of an original staining and coatings layers from a Bembe and Kimbel armchair from the Hall of the House of Representatives 1857. 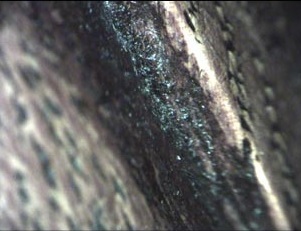 Other images show the information that is obtained, and shared with clients, when conducting detailed testing of objects and furniture at Schuettinger Conservation Services.